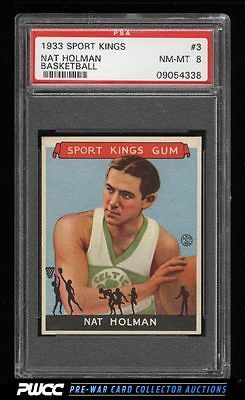 Stunning Holman rookie on the auction block this month. The offered '8' is one of just twelve to reach the difficult PSA designation and represents the finest example to be publically offered in over a year. A tremendous card with four rock-solid NM-MT corners, beautiful centering and fantastic borders. The surfaces are near flawless and boasts strong print, color and focus throughout. The finest example we've brokered in our 15+ year tenure. One of nearly 20,000 cards, lots, and sets up for bid in our 7th Auction of 2016. Click on the link above to view the other PWCC auction lots.